Kiahuna Deluxe 2 BR Condo ... Kontakt Besitzer für Preise! Das Hotel liegt an der sonnigen Südseite von Kauai at Poipu Beach, ist dieses romantische Kulisse einer der Hawaii besten. Schöne goldene Strände, wunderschöne Sonnenuntergänge, Palmen und spektakuläre Kiahuna Plantation Gründe machen unsere Wohnung eine unschlagbare Lage für Ihren "Traumurlaub". Poipu ist ein idealer Strand zum Schwimmen, Schnorcheln und Surfen .... bewerteten das beste auf Kauai. Die Wohnung ist günstig, um sowohl feine und Casual Restaurants, einzigartige Einkaufsmöglichkeiten Flecken, und ausgezeichnete Golfplätze. Dieser Ort ist ideal für die Nutzung von all den wunderbaren Aktivitäten Kauai zu bieten hat. Unsere geräumigen 2 Schlafzimmer, 2 Bäder Wohnung schläft bequem bis zu sechs. Die obere Etage mit Küche, Wohnzimmer und Veranda bietet eine wunderbare Aussicht auf das Meer, die Lagune und Plantagengärten. Wir haben vor kurzem renoviert die Küche Zugabe Granit Zähler und neue Schränke. Die Schlafzimmer sind im ersten Stock mit einer zusätzlichen Veranda aus dem Schlafzimmer befindet. Sie werden mit allem, was Sie für einen perfekten Besuch mit einer Waschmaschine / Trockner, Bettwäsche, Handtücher und eine voll ausgestattete Küche müssen eingerichtet werden. Gas BBQ sind in der Nähe des Gerätes. Mit solch einer schönen Lage macht es Spaß, einige Mahlzeiten "zu Hause" zu beheben! Eine Strandhütte ist für Strandtücher und Stühle sowie Schnorchel und Surf-Equipment-Verleih zur Verfügung. Für Familien mit kleinen Kindern, hat unsere Wohnung zwei porta Krippen, ein Kinderwagen und Kindersitze für die Kleinen. Es gibt sogar eine große Lieferung von Spielzeug für den Strand, ein Muss für einen vergnüglichen Tag im Sand! Die gesamte Kiahuna Plantation bietet eine friedliche, ruhige Lage zum Entspannen und genießen Sie Ihren Urlaub auf Hawaii. Unsere Einheit ist von Castle Resorts, 2253 Poipu Road, Koloa, Kauai verwaltet. Die Rezeption ist 24 Stunden am Tag für Ihren Check-in und jede andere Bedürfnisse. Wir hoffen, dass Sie diesen wunderbaren Ort im Paradies für Ihre 'home away from home' in Kauai bieten. Kathedrale Decke im großen Saal, Liegestühle und Handtücher werden gestellt. Porta-Kinderbetten, Kindersitze und Kinderwagen zur Verfügung. Our family truly enjoyed our stay at this condo. It was very spacious, clean and cute, and the location was perfect! We could see the ocean/waves from our lanai and it was a very short walk to the beach. It was also a short walk to the shopping mall across the street which had Starbucks and an info station that was like having a concierge for planning our activities while on Kauai. The condo was equipped with everything we could need such as in-house washer/dryer, booster seat for my baby to eat at the table, beach toys and boogie boards. And if I ever decide to run the Kauai marathon (Labor Day weekend), this would be the perfect place to stay as the start line was so close, and the finish line a short walk away. Thank you, Janet, for letting us stay at your perfect condo! We are glad you enjoyed your stay and hope you return soon. This was our second family vacation staying at this condo. Our family of five had plenty of room. The condos are a little older, but this one has been updated. The whole plantation has huge trees and grassy areas throughout. The beach is just a short walk from the condo where you can learn to surf or just play on the waves. 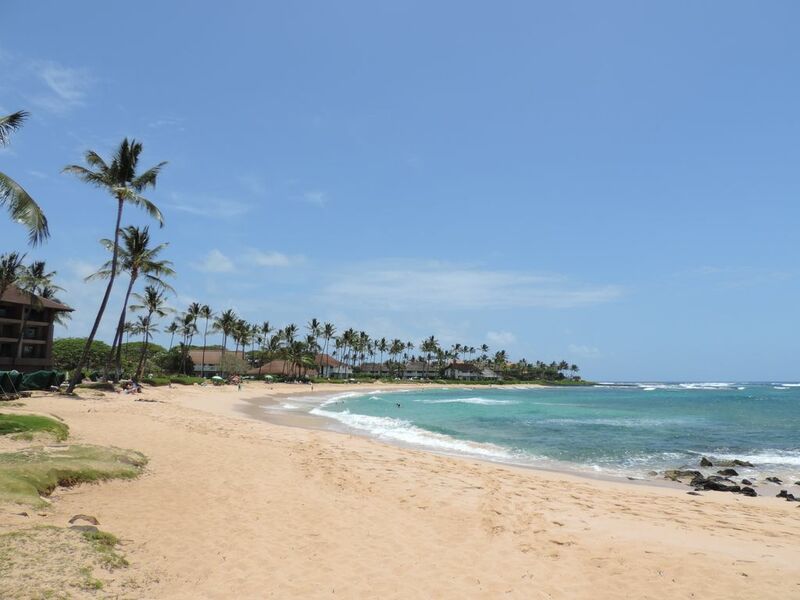 The beach area is perfect for boogie boarding and snorkeling. If you get tired of this beach you can walk down the way to many other beaches. All are perfect to play in. There are also two shopping areas a short distance away. One is within walking distance. There are outdoor BBQ's located all around the plantation. Two are very close to the condo. I could watch my husband and son play frisbee while they were cooking dinner. Janet, the owner, was extremely helpful in answering any questions I had before my trip. Check in was a breeze! The condo was already stocked with boogie boards and some snorkel gear. It also had baby items if needed. Our favorite part was waking up to the wind and drinking coffee on the Lanai while watching the ocean waves. We love making our family memories in this great condo and on this beautiful island! My family and I stayed here the week of Thanksgiving, with my parents and brother + his family staying in the same complex. It was an excellent "home base" for our Kauai vacation, with plenty of room for the four of us, plus a large kitchen/dining area where we could prepare and enjoy meals with the whole family. The kitchen was well-stocked, and there was a large dining table where we could all gather for family dinners. There was a gorgeous view from the upstairs lanai, and I loved watching the sunrise with my cup of coffee in the mornings. There was much to do within walking distance including the beach, a luau, restaurants and shops, and a pool. It was a quick drive to beautiful hiking, ziplining, and Poipu Beach. The owner was very nice to work with. Cannot wait to return sometime! This was our second visit to this fantastic Beach Bungalow! We really enjoy staying at the Kiahuna Plantation as we love being able to walk to the beach and the Plantation Gardens and to all the shopping and eating places directly across the street. The bungalow itself has lovely furnishings as well as the open air feeling with it's high ceilings. The balcony which overlooks the lagoon has a beautiful ocean view and is a great place to start your day with coffee in the morning and end your day with a cocktail in the evening. It is very convenient to have a closet filled with your beach needs, snorkeling gear, boogie boards, sand toys, etc. Not to mention a washer and dryer if needed. I'm sure for our next visit to Kauai, we would choose this bungalow to stay. The owners are so friendly and kind and they try to make sure your every need is taken care of. We are always very thankful to have had such a great vacation in their lovely bungalow. Used our 25th Anniversary and two college graduations as the excuse to return to Kiahuna Plantation, where we spent a week of our honeymoon. (Also returned to the north side of the island at Hanalei Bay Resort and highly recommend trying to do both in the same trip, with at least four days for each.) Really is as wonderful a place as we remember it, even with our 20-something kids in tow this time. The two-story condo was perfect for us. The resort itself is marvelous and has been extremely well maintained. Made great use of the adjacent beach and the athletic club with pool directly across the street. We had an absolutely marvelous stay here. Kiahuna Plantation is our favorite place to stay on Kauai and this condo is now our favorite unit! It sits between the lagoon and the Plantation House Restaurant garden. I wasn't sure I would like staying away from the main grass area where we've stayed before, but found we loved sitting on the lanai above the lagoon with a direct ocean view. The lanai table was pub height so the railing didn't interfere with the views. It's only a short walk to the main beach area and beach hut for towels and chairs. The kitchen has recently been remodeled and the whole upstairs is open and airy, as well as extremely well equipped. We noticed most of the units have plantation shutters on the windows and sliding doors, which obstruct some of the view. We liked that 208 has sliding, vertical rattan shades that pull completely to the sides allowing lots of light and full views. The living and dining room furniture is comfortable and the TVs have good reception (tip - one of the weekly guide magazines has the TV schedule). In addition, the beds are comfortable, there's good closet space and hangers and the unit has a washer/dryer, so no need to pack more than a carry-on's worth of clothes. Janet was very nice to work with and booking with her was a breeze. Check-in is at 3:00 or 4:00 PM, but our flight arrived at 9:30 AM, we picked up our care, stopped at Costco and the Big Save Market, just across the street, to stock up. We then hit the Saturday farmer's market at the community college, had lunch and arrived at Kiahuna around 2:00. Check-in was a breeze and the condo was ready and waiting. Be sure to take advantage of the morning concierge orientation on the restaurant lanai early in your stay. Lots of good information on things to do and see. But I would recommend checking prices online or in the local advertising booklets for activities you're interested in before booking with the concierge. We later found we would have saved almost $50 a person on the Napali coast rafting trip we took had we booked through the company's website. And one of the booklets had a coupon for the irrigation ditch tubing for less than we paid at their website....do your homework! We found that the units on either side are also rentals, so we're looking forward to planning a whole family trip sometime in the future! Call owner for current rates.... 530-836-2495. Free parking.